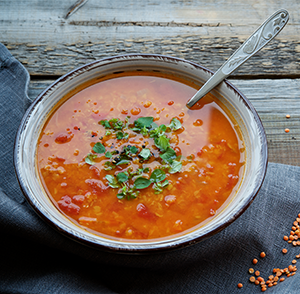 After a day tromp­ing through the restored prairie, enjoy this deli­cious soup! Cut up one or two good-sized fresh tomatoes—at least one cup of cut toma­to. Put it in a pot and cook slow­ly for twen­ty min­utes. Add salt and pep­per to taste. or get some­one to help you put it in a food proces­sor. Stir in one cup of milk blend­ed with one Table­spoon of flour. Sim­mer for 5 min­utes, or until soup has thick­ened. Pour into 2 cups—one for you, one for a friend. Enjoy. This is a recipe that I think even I can han­dle! It sounds deli­cious!